Alaska Bowhunting Supply and the GrizzlyStik brand were founded in 1994, in Anchorage, Alaska and grew into one of the largest traditional archery companies in the United States. Our original product line primarily focused on leather shooting gloves, tabs, quivers and string silencers. In 1998, we started production of our GrizzlyStik® line of tapered arrows at the St. Croix Rod company. Soon after we began US distribution of the German Kinetic Silver Flame broadhead line. Starting in 2007, we began to shift GrizzlyStik away from our roots in traditional archery products. Our sole focus became researching, designing, testing and manufacturing a premium arrow and broadhead system. Guided by the 30 years of Dr. Ed Ashby's arrow penetration research, our focus became supplying bowhunters with lethal arrow performance on trophy and dangerous game. In 2008, we acquired the Silver Flame® broadhead name and manufacturing rights. In the same year, we started working with Dr. Ed Ashby to design, test and manufacture the Ashby® single bevel, 440C stainless, 315 grain, hammer forged broadhead. GrizzlyStik and Victory Archery came together in 2017 to form a R&D and manufacturing partnership. Both companies currently work together to design, test, manufacture and market the highest quality archery products in the world. GrizzlyStik Momentum® TDT arrows are manufactured using a Victory Archery 3K woven carbon and are designed with .001"/per inch continuous external taper to maximize FOC, arrow flight and structural integrity. Our tappered hunting arrows are built to an Olympic arrow tolerance and drive our broadheads through bone. The GrizzlyStik broadhead line is made up of the Ashby®, Alaskan, Samurai, Maasai and Silver Flame®. All our broadheads are manufactured with 440C stainless steel, are sub-zero quenched and hardened to a 58 Rockwell. GrizzlyStik broadheads range from 100 to 315 grains and are unequaled in the industry for sharpness. The Ashby, Nanook and Monarch broadheads are the only hammer forged heads in the marketplace. In 2014, Alaska Bowhunting Supply officially became GrizzlyStik and our headquarters relocated to Bend, Oregon. Around the globe, the GrizzlyStik arrow and broadhead system has earned the Gold Standard among the world's top PH's, guides, outfitters and traveling bowhunters by compiling an unmatched record of performance and success. The volume of customer testimonials, photos and videos are a testament to Dr. Ashby's research. From Elk to Elephant and Brown Bear to trophy Whitetail, we customize our arrow and broadhead systems to meet the individual bowhunters needs. Our GrizzlyStik systems range from 650 to 1250 grains and reach an industry leading 19% to 30% FOC. GrizzlyStik is in the business of your bowhunting success. We are dedicated to the development of products that are best in class for bowhunters that don’t compromise when it comes to their equipment. We firmly believe our customers should spend more time recovering their arrow after a shot than recovering their animal. Our "responsibility" is to give our customers the highest probability to quickly and humanely harvest the animals they bowhunt - regardless of the circumstances. As bowhunters, we each have a limited number of shot opportunities on big game in our lifetime. Maximize your probability of success on each and every shot opportunity you get. Shoot the GrizzlyStik system. GrizzlyStik is different - talk to us direct, buy from us direct. Our GrizzlyStik arrows and broadheads are very different - from almost everything currently marketed in bowhunting today (light, fast, mechanical). Due to these many differences, new customers to GrizzlyStik usually have many understandable questions. We try to address the most common in our FAQ section but there can be thousands of nuances to achieving perfect arrow zen. For this reason, we recommend if you have questions, please call us - we love to talk bowhunting. It gives us a chance to discuss your upcoming game hunted, answer your product questions, help set your product expectations and recommend the best products to ensure your bowhunting success. If you have questions about our GrizzlyStik gear, why not get the answers directly from GrizzlyStik? We can be reached at 888-697-9828 to answer any questions you have about our products. 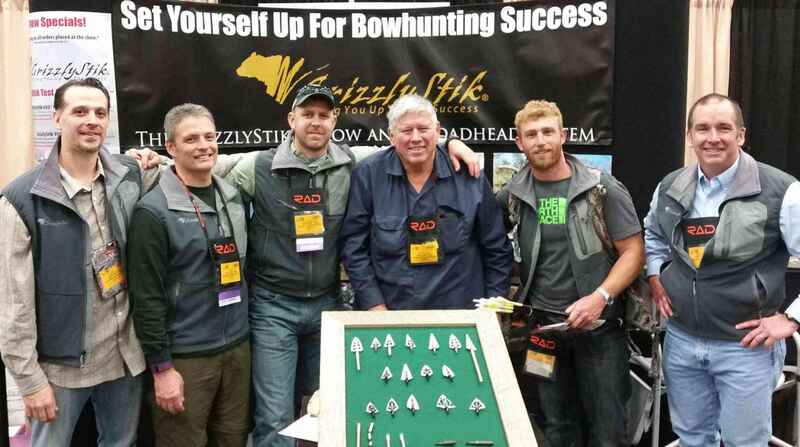 Dr. Ed Ashby (center) and the GrizzlyStik team at Dallas Safari Club. 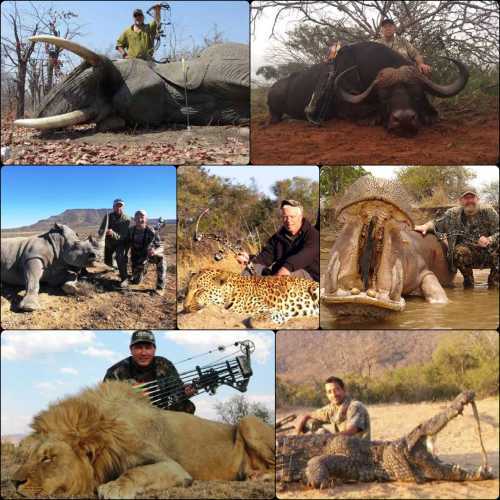 This core group envelopes the expertise of over 1,000 big game animals successfully harvested with bow, arrow and broadhead. GrizzlyStik is driven by two core passions. 1. Developing, educating and supplying bowhunters with the best products in the world. Our GrizzlyStik products are rigorously researched, designed and real world tested – not media spokesperson tested. 2. Offering stellar customer service and technical advice that helps our customers select the best equipment for their specific needs. Gear that won’t let them down and enhances their chances of success and – in the end – ensures their overall customer satisfaction. If you ever have an issue with our products or customer service, I invite you to call me directly. I will do my best to rectify any situation to your 100% satisfaction. The buck stops with me - period. We pride ourselves on the one-on-one relationships we build with our customers.